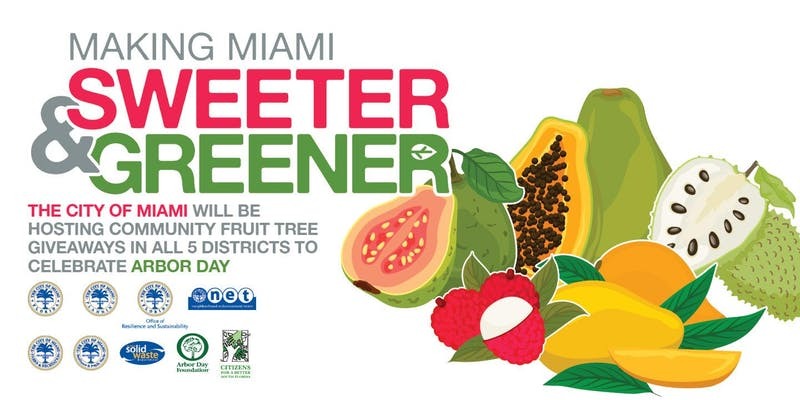 The Planning Department’s Environmental Resources Division will be hosting fruit tree giveaways in each of the City’s 5 Districts. City of Miami residents will have an opportunity to receive up to 2 trees per household as part of the City’s Arbor Day festivities. The City will be distributing 1,000 trees between the 5 districts. You MUST be a City of Miami resident. Residents are encouraged to attend the giveaway in their district. Proof of City of Miami residency will be required on the day of the event. Unincorporated Miami-Dade County residents are not eligible to receive a tree. Residents MUST complete the online registration form. The address provided on the registration form MUST match the address on the proof of residency. Tree quantities for each fruit are limited and will be given away to registrants on a first come first serve basis. A maximum of 2 trees per household. BE SURE TO SELECT HOW MANY TREES YOU WANT. Select 1 ticket for 1 tree and 2 tickets for 2 trees. Should you register for more than 2 trees for your household, your registration will be cancelled. For more information, please email EnvironmentalRes@miamigov.com or call 305-416-1416.